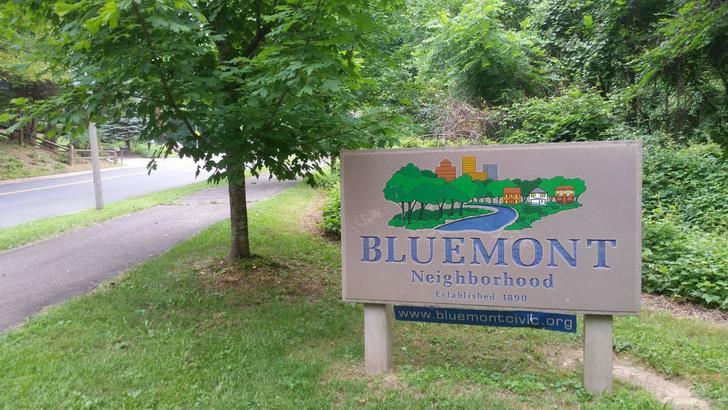 Bluemont neighborhood in 2 sentences: Bluemont is a large neighborhood located just west of Ballston that features many parks, bike trails, and mature trees. The proximity to the Metro, walkability to retail and restaurants, and diverse housing inventory that may be less expensive than you would believe are some of the many reasons that people enjoy living in Bluemont. Bluemont is one of the largest neighborhoods in Arlington. The community boundaries encompass over 2,400 households. There are even subdivisions within Bluemont that are a substantial size and some you may have heard of or even be familiar with. Some of these subdivisions include Lacey Forest, Brockwood, Bon Air, and Brandon Village. Officially, the Bluemont neighborhood is bounded by Carlin Springs Road on the south, the W&OD Trail on the west, North Jefferson on the west north of 66, Washington Boulevard on the north, and Glebe Rd on the east. Bluemont was established in 1890 and its history is deeply rooted in the rail transit that made its way through the neighborhood and and on into the District. At one point all eastbound or westbound trains passed through Bluemont Junction. The Junction ceased operation in the mid 1900’s and is the location is now located in present-day Bluemont Park. The neighborhood got its name from the town of Bluemont, Virginia in Loudon County which was the final stop on the Washington & Old Dominion Rail Road that connected through present-day Bluemont in Arlington. The neighborhood is primarily made up of single-family homes. As we get to the fringe of the neighborhood on Glebe, we do start to see some townhouses and apartment complexes. There are also a lot of businesses that call Bluemont home. In addition to the section of Glebe from Carlin Springs to Washington Blvd, there’s also a number of restaurants, shops, and a grocery store along Wilson Boulevard. The area along Wilson Blvd from Greenbriar to George Mason is kind of like Bluemont’s village center. It’s almost like Westover Village in a way where you have a main road with retail and restaurants on both sides. Now I don’t think people from Westover would appreciate me making that comparison because right now, Westover has a lot more going for it. At Bluemont, you have the pieces in place to create a village center. However, you will need more development (and more attractive businesses) to create this. First, you have to find a way to slow down traffic and create better pedestrian access. It’s hard to walk on Wilson Blvd with the current sidewalks. Second, you need businesses clustered closer together. La Union is awesome but it’s also a good 3 blocks away from everything else. And third, you simply need better restaurants. Make no mistake, Pupatella is by far the best pizza in Arlington, but from there it drops off. Fettosh and Layalina are decent but there are only really a few options in the neighborhood. Look for improvements to be made to this section of Bluemont. The potential is there, the community just needs to make the right decisions in order to create an attractive strip of retail. Homes can vary dramatically within Bluemont depending on where you are in the neighborhood. We will briefly breakdown a few of the subdivisions in the neighborhood to give you a primer on each specific section of Bluemont. Lacey Forest is the most desirable part of Bluemont. The houses are the nicest and the streets are well laid out. This is the section of Bluemont that is north of I-66, south of Washington Blvd, and bounded by George Mason on the east and North Jefferson Street on the west. There is great walkability to Lacey Woods Park from this vicinity. Although the walkability to Metro is better in other parts of Bluemont, Lacey Forest makes up for it by being a short stroll away from the shops and restaurants of Westover Village. This part of Bluemont is located north of Wilson Blvd, south of I-66 and sandwiched between the Bon Air Park (Rose Garden) and Jefferson Street. This subdivision is characterized by winding streets and moderately-sized front yards. Because I-66 boarders the northern part of the neighborhood, there is no cut-through traffic; these streets either end in a cul-de-sac or simply run parallel to I-66 (and the Custis Trail) before looping back toward Wilson Blvd. Homes are situated close to one another and you will tend to see homes that are a little bit smaller than you would in Lacey Forest. We are starting to see some tear-downs mixed in with new construction homes and of course those older homes that have been renovated. The Bon Air subdivision will be roughly just south of Wilson Blvd, east of Bluemont Park, west of Illinois Street, and north of the Bluemont Drive. This area will have more rental homes and homes that are a little more affordable. That’s not to say that there will not be million dollar properties here, because there are, but compared to Lacey Forest or Brookwood, Bon Air will have a slightly older housing inventory which leads to smaller and inevitably cheaper homes. This area is great for those who need the space of a house, want to be close-in to Arlington, and also have a smaller budget as it is common to see prices in the $600,000’s and some that are even in the high $500,000’s. Brandon Village is going to be the location in Bluemont where you can find the most affordable homes, and therefore, the most eclectic inventory. Brandon Village is just east of Bon Air and is bounded by Wilson Blvd on the north, Bluemont Drive on the south, Illinois St on the west and George Mason Drive on the east. You would think that this location would be prime for tear-downs, but right now the market is not there for it. New construction homes for sale in Brandon Village only go for around $1 million or slightly over so that really limits the number of investor-purchased properties in the neighborhood. In 2015, homes that sold ranged in price from $659,000 to $1,050,000. While you can get a bargain in Brandon Village, these streets are not going to be winning any awards for aesthetics any time soon. Again, this part of Bluemont is a great opportunity to buy into a neighborhood if you can handle a few years of underdeveloped lots and houses before the development heads west to Bluemont. Bluemont is huge. And each section of the neighborhood is going to feel a little bit different. Even though homes south of Wilson are usually a little older, maybe a little smaller for some people’s taste…it also has better walkability, it’s closer to retail, it’s closer to the bike trails, and it is closer to Arlington Forest Club. Each part of the neighborhood has something going for it. It will simply come down to your tastes and what type of home and ambiance you are looking for in your neighborhood. The neighborhood as a whole is pretty laid back. There are block parties in the summer. Many parts of the neighborhood are walkable. Some walk to the Ballston Metro along the bike trail, although that is a decent walk. As we start to see development head west, it will be interesting to see how Bluemont adapts to future changes in the neighborhood. We are going to see better retail, restaurants, and shops and that will affect the Bluemont real estate market, but by how much? More new construction homes will make their way to Bluemont but it will take a while for all the older homes to turnover. There is tons of opportunity to buy into a neighborhood that should see a significant amount of development in the future. Some streets may need more help than others, but that’s the beauty of buying into Bluemont. The neighborhood is significantly more affordable (for now), still has tremendous amenities, and has a location that is walkable and bikeable to the Metro. These are all intangibles that make for a great neighborhood for years to come.